Rajasthan has been home to numerous tribal & nomadic communities, the tribes of Rajasthan constitute approximately 13.5% of Rajasthan’s population. Each of these tribes can be identified by their own culture, customs, trades, fairs & festivals. Bhils & Minas constitute the majority of population of the tribes of Rajasthan. Bhils are the largest tribe in Rajasthan. Banswara is the main area where Bhils in large numbers. The Bhils are considered to be fine archers. Infact, Bhil bowmen even found a reference in the great epics Mahabarata and Ramayan. The Bhils were originally food gatherers. However, with the passage of time, they have taken up small-scale agriculture, city residence and employment. The major fairs of Bhils are the Baneshwar fair (held near Dungarpur) and Holi. The Ghoomar dance is one well-known aspect of the Bhil culture. The name Mina is derived from Meen,meaning ‘fish’ in Sanskrit, and the Minas claim descent from the Matsya Avatar, or fish incarnation, of Vishnu. The main reference of belief is based on the scripture of the Matsya Purana. Before the rise of Rajputs during medieval period, Rajasthan had multiple mina kingdoms. The Minas are spread across the geography of Rajasthan, however, traditionally are concentrated in the shekhawati region surrounding Jaipur. DAMOR Also described as Damoria, belong to mostly Dungarpur, Udaipur districts and in lesser numbers in Churu and Ganganagar districts of Rajasthan. The Indo-Aryan language, Vagri, is their mother tongur and they are also conversant with Gujarati and Mewari. Damors are mainly cultivators and manual laborers. Garasias is a small tribe inhabiting Abu Road area of southern Rajasthan. Sahariyas are considered as the most backward tribe in Rajasthan and are the only group included in Particularly Vulnerable Tribe (PGT) from Rajasthan. Believed to be of Bhil origin, they inhabit the areas of Kota, Dungarpur and Sawai Madhopur in the southeast of Rajasthan. Their main occupations include working as shifting cultivators, hunters and fishermen. British in 1871 passed Criminal Tribes Act and labeled over 200 of such communities as notified tribes for criminal tendencies. Post Independence, Government repealed the Criminal Act but introduced another law, the Habitual Offenders Act (1953) around 150 tribes have been labeled as de-notified tribes. These are tribes that have failed to integrate into Indian Society and so do not have sustainable livelihood means. Hence, they frequently engage towards criminal activities. 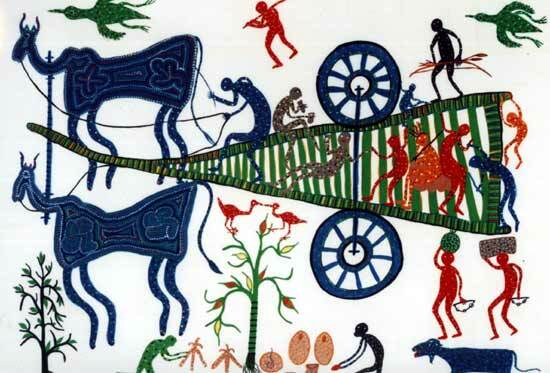 The Banjaras are nomadic caravan runners who travelled with balaads or oxen-laden caravan and who continued travelling wherever their caravans were in demand. Gadiya Lohars are wandering blacksmiths that are named after their attractive bullock carts called gadis. Gadhiya lohars are found are Kathodi and Rabaris in Mewar region. The Rabaris are still nomadic, an equally colourful sub-group that still travels over the desert in search of pastures for its flocks of sheep and camels. Their tradition is that their ancestor was brought into existence by Lord Mahadeva in order to tend the first camel, which had just been created by Parvati for her amusement. Their two main divisions are Menu and Chalkais. The Menu deals only in camels and occupies a superior position to that of the latter. They can marry the daughters of Chalkias without giving their own in return. The Chalkias keep larger herds of sheep and goats. Raika farms, called Dhanies, lie scattered over the countryside. The framers of the Constitution took note of the fact that certain communities in the country were suffering from extreme social, educational and economic backwardness arising out of age-old practice of untouchability and certain others on account of this primitive agricultural practices, lack of infrastructure facilities and geographical isolation, and who need special consideration for safeguarding their interests and for their accelerated socio-economic development. These communities were notified as Scheduled Castes and Scheduled Tribes as per provisions contained in Clause 1 of Articles 341 and 342 of the Constitution respectively. 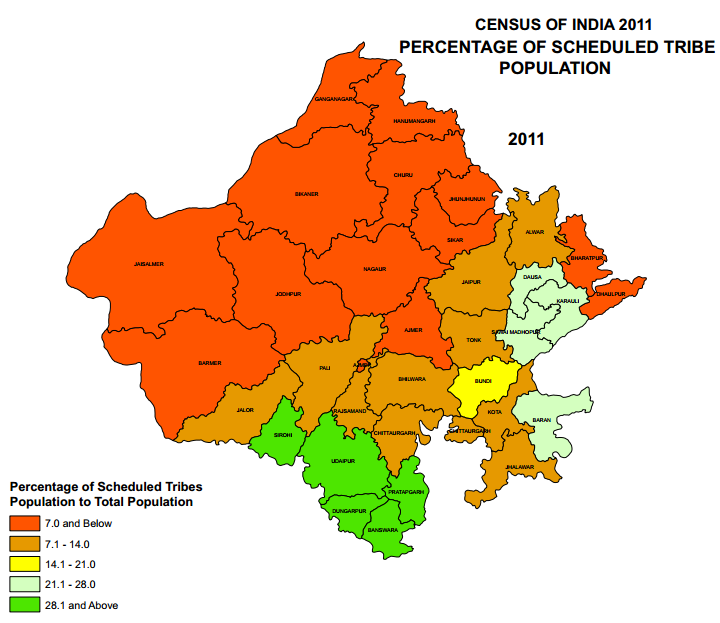 Scheduled Tribes are those, which are notified as such by the President of India under Article 342 of the Constitution. The first notification was issued in 1950. The President considers characteristics like the tribes’ primitive traits, distinctive culture, shyness with the public at large, geographical isolation and social and economic backwardness before notifying them as a Scheduled Tribe. 75 of the 698 Scheduled Tribes are identified as Primitive Tribal Groups considering they are more backward than Scheduled Tribes. They continue to live in a pre-agricultural stage of economy and have very low literacy rates. Their populations are stagnant or even declining. To ensure the protection of aboriginal customs, culture of the tribes and prevent alienation of their lands and natural resources to non-tribals article 244 of the Constitution has the provision for declaration of Schedule V & Schedule VI areas. Schedule V areas can be declared in any state except Assam, Meghalaya, Tripura and Mizoram. Consequently, 5th schedule areas have been declared in in 9 states of India namely Andhra Pradesh, Jharkhand, Gujarat, Himachal Pradesh, Maharashtra, Madhya Pradesh, Chattisgarh, Orissa and Rajasthan. In Rajasthan: Banswara, Dungarpur (fully tribal districts), Udaipur, Chittorgarh, Siroi (partly tribal areas) have been declared as part of Schedule V areas.